With this Deluxe Kegerator Conversion Kit, Kegco provides everything you&apos;ll need to quickly convert your refrigerator into a beer dispenser and begin dispensing delicious cold draft beer! Keg Coupler Kegco KT85D-L "D" System Keg Coupler. 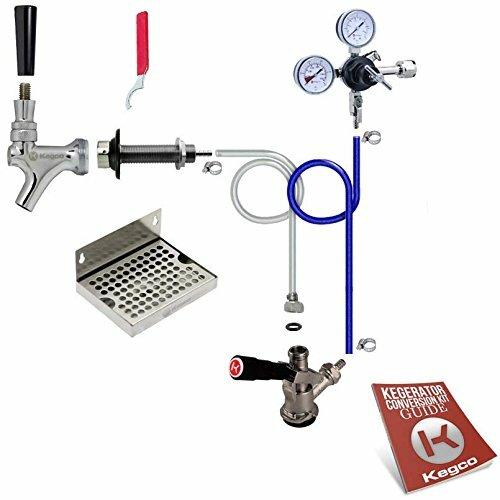 With this Deluxe Kegerator Conversion Kit, Kegco provides everything you'll need to quickly convert your refrigerator into a beer dispenser and begin dispensing delicious cold draft beer! From the durable commercial grade double gauge regulator to the NSF approved commercial-grade American D System keg coupler, every part is high quality and built to last, so you can dispense your own beer for years to come. We've even included a stainless steel drip tray that contains any drips, so cleaning up after every use is just as easy as the initial assembly! Detailed instructions are included in every kit. - HEAVY DUTY FAUCET WRENCH: Make repairs and adjustments to your draft beer system like a pro using this heavy-duty faucet wrench. This durable metal wrench has a vinyl coated red or blue handle that provides an easy grip while loosening or tightening shank collars, allowing you to quickly attach or remove your faucets without scratching them. - LEVER HANDLE KEG COUPLER: This NSF-approved Kegco KT85D-L "D" System Keg Coupler features a sturdy nickel-plated forged brass body with a stainless steel probe, and is designed for use with all domestic brand American D system Sankey kegs. The lever-handle design is easy to use - simply pull out and then down on the handle to couple the keg. A 55-psi pressure relief valve makes this coupler even more convenient to use, allowing over-pressurized gas to escape before it enters your keg. - DUAL GAUGE REGULATOR: Durably constructed to deliver a consistent flow pour after pour, this Kegco 762 Commercial Grade Double Gauge Regulator features a T-style adjustment valve that makes it easy to adjust the pressure inside of the keg. The gauge on top of the regulator indicates CO2 pressure in the keg, while the gauge on the side indicates the remaining volume of CO2 gas. A pressure release valve is conveniently located on the body. - DOOR MOUNT STAINLESS STEEL DRIP TRAY: Our 6" x 4" door mount drip tray's clean design, durable stainless steel construction, and attractive brushed finish have made it a favorite of beer lovers. Hassle-free from start to finish, this drip tray can be quickly and easily mounted using the two screw holes in the backsplash, and when you're done dispensing for the day, a removable grill makes clean-up a breeze. This drip tray does not have a drain, so it will need to be emptied manually. - CHROME BEER FAUCET WITH BRASS LEVER: Featuring a forged brass body and highly polished chrome finish, this NSF-approved beer faucet puts a stylish finishing touch on your kegerator at a price you'll love. The brass shaft assembly and lever includes a non-stick ball washer for smooth operation, and the lever has standard threading that is compatible with most branded tap handles.